Inmod's high quality replica of Harry Bertoia's original 1952 design is functional, affordable and infamous. Crafted of stainless steel wires and optional cushions in a wide array of upholstery choices, this iconic stool is as popular today as it was in the 20th century. 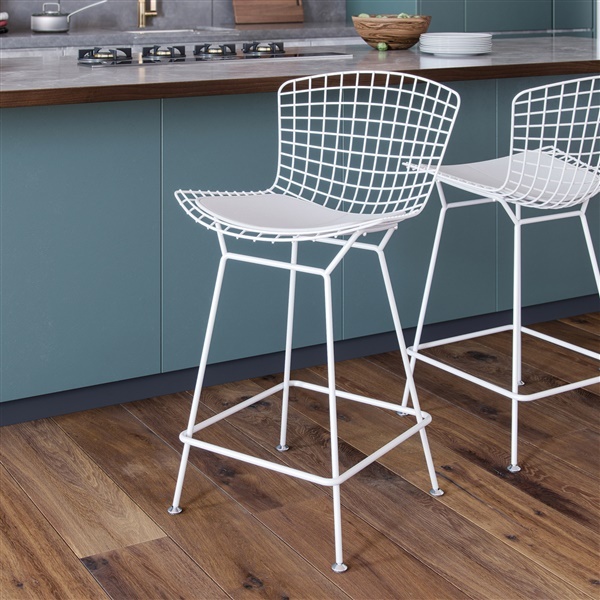 Stocked in the most sought after combinations or special ordered to enhance your homes existing decor, the Bertoia Counter Stool is a timeless modern design. Our two arrived yesterday. They were very well packed and wrapped--even with desiccant packs to absorb any moisture. What impressed us was their sturdiness, heaviness, and quality of fabrication. The pads are quite sufficient to ensure comfort. And, man!, do they look great! 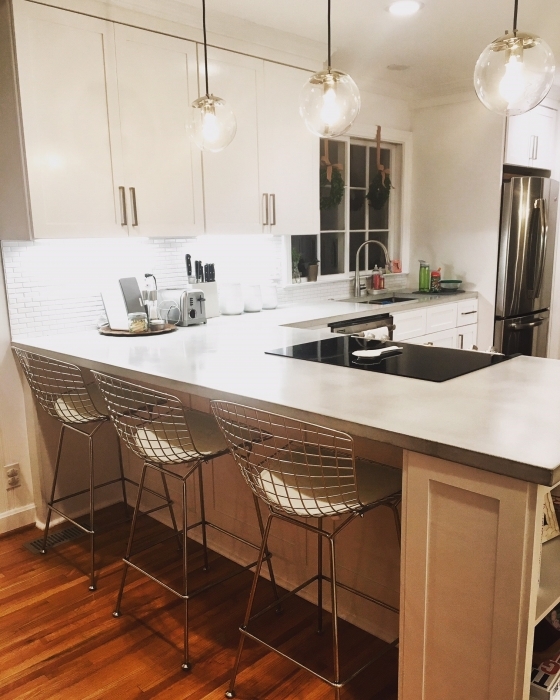 The clean form of the Bertoia counter stool looks great in many styles of homes. It probably won't work in a French provencial or folksy farmhouse.... but it looks great in my Danish Modern in a ranch house at the lake. The chairs are so comfortable that my husband and I sit at the bar to eat our meals. Don't forget to order the seat and back pads. 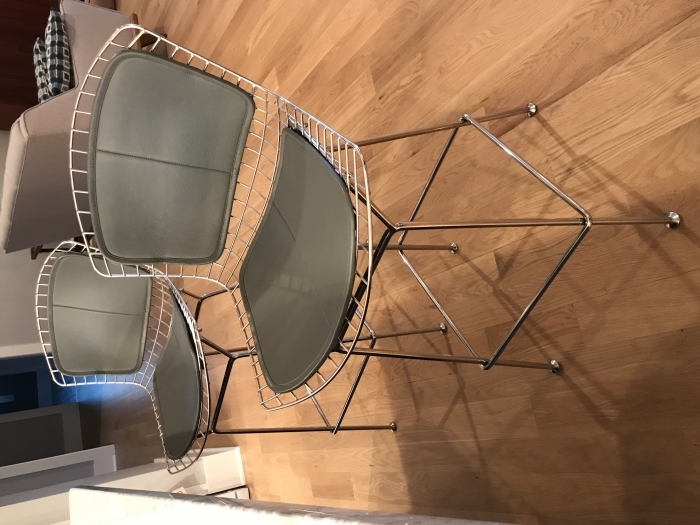 These Bertoia Counter Stools are stylish, durable and very comfortable. They arrived packaged well with no damage and were on time. The best part is they came fully assembled! We have received many compliments from friends and family. Two thumbs up!!! INCREDIBLY ATTRACTIVE DESIGN, EXCELLENT QUALITY, GREAT CHOICE! Remarkable, attractive, arrived on time and excellent quality! STUNNING! STYLISH! They are great, everything I hoped they'd be and more! Speedy delivery and excellent customer service! Thanks a bunch!! Wire furniture is much easier to maintain and keep looking like brand new! Assembly was a breeze too. Thank you! 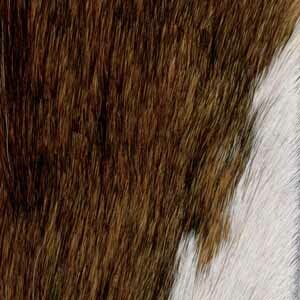 Brilliant sheen, sculptural design, great choice for my home - love this site, always find the best furniture on here! Rarely do I find wire furniture of this quality and caliber - Inmod has some really impressive reproductions, I'll be back! Captivating design!! Everyone who has visited my home since their arrival has made a positive remark about them - totally thrilled with my purchase! well-known design in my home has been making a big impact so far, excited to order from here again! client was looking for retro-style sitting for their kitchen design at home, they are so happy with these! We are thrilled with the replication of the original design. ProsThey were the best replicas of the originals that we found. The quaility is very good and they are well made. I ordered 2 of these chairs in black with grey fabric seat and back covers. They are very well constructed and stylish. The feet appear to be stainless and they rotate a bit to accommodate uneven surface. The black coating over the steel is not very shiny; more a matte or satin, which I also like. the company called me on the phone to tell me they were unhappy with the seat covers they received and offered me an upgrade from the more premium fabric and leather choices. They really care. Be aware though that these are not the most comfortable chairs. They are a little hard to get into and the metal is a little hard on the back of your legs. The seat back inclines a bit too far for comfort. These little negatives do not bother me because it is not how you feel, but how you look. Where are the chairs made? The Bertoia Counter Stools are made in our exclusive facility located in China. Does this ship fully assembled? Yes, the Bertoia Counter Stool ships fully assembled. If I order just a seat pad for this chair and later decide I want to order a seat back, can I get one after the fact? Yes, that would not be a problem. Just reach out to us if you want to order the back cushion and we can help you with that. What is the lowest height of the seat and the highest point since the seat curves? The lowest point of the seat is 25.6" and the highest point is 28.3". For the cushion, you need to add .4" to the 25.6"
Are these original Bertoia design? Or are they a replica with some differences? 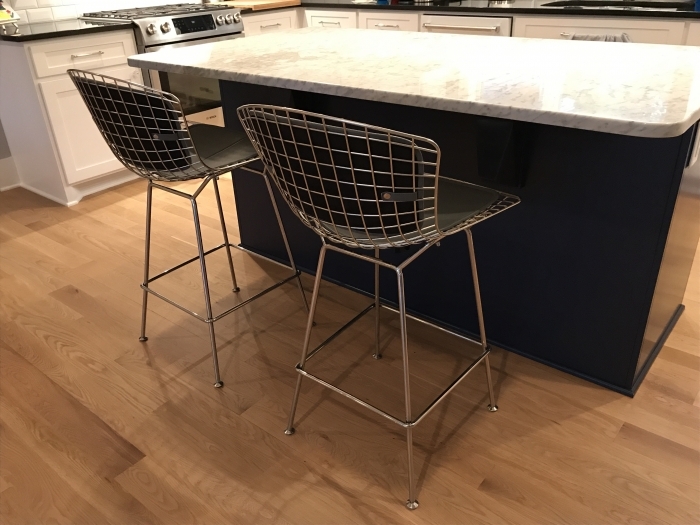 Our Bertoia Counter Stools are a highly accurate reproduction of the originals, using the same high quality materials. The dimensions of this stool are incredibly close to the original Bertoia design. Is there any assembly required?How until items can be shipped? The Bertoia Counter Stool is shipped fully assembled. For this special order item, the lead time is 8-10 weeks. Would these stools in either the stainless steel or black powdercoat be suitable for outdoor use? At this time, our Bertoia Counter Stools are not made for outdoor use. is this stool made of stainless or chrome? The Bertoia Style Counter Stool is made from polished stainless steel. If I order with the seat pad, is it easily removable/interchangeable? Yes, the seat & back pads of the Bertoia Style Counter Stool can be easily detached for your convenience.